found guilty of a criminal offence unless two elements are present, i.e. actus reus and mens rea. 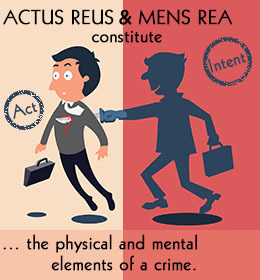 Mensrea means ‘guilty mind’ whereas actus reus means ‘guilty act’. The latin phrase, actus reus non facit reum nisi mens sit rea, means an act does not make a person guilty unless mind is also guilty. Actus Reus is the physical element of a crime. It can be in the form of an act, an omission or a state of affairs. It's the actual conduct which caused the crime. (Such as for a battery; the actus reus is the unlawful application of force (touching). Mens Rea is the mental element of a crime. It's what goes on inside the defendants mind. It can be in the form of direct intention, indirect (oblique) intention or recklessness. (Eg. the mens rea of a battery is is intention or recklessness). Technically the Doctrine of Mens Rea is not applied to the offences under the Indian Penal Code. Here it is wholly out of place. In the Indian Penal Code, 1860, every offence is defined very clearly. The definition not only states what accused might have done, that also states about the state of his mind, with regard to the act when he was doing it. Each definition of the offence is complete in itself. The words “mens rea” are not used any where in the Indian Penal Code. However the framers of the Code used the equivalent words to those of mens rea in the Code very frequently. Such expressions are – Fraudulently (Section 25); Dishonestly (Section 24); Reason to believe (Section 26); Voluntarily (Section 39); Intentionally; etc. Moreover in the Indian Penal Code, a separate Chapter (Chapter-IV) on General Exceptions is provided. Chapter-IV (Ss. 76 to 106) explains the circumstances, where options of criminal intent may be presumed. Comparing with English Law, Mens Rea has been applied by the Indian Courts, and it is now firmly settled law that Mens Rea is an essential ingredient of offence. State of Maharashtra v Mayor Hans George, AIR 1965 SC 722: Mens rea by necessary implication can be excluded from a statute only where it is absolutely clear that the implementation of the object of a statute would otherwise be defeated and its exclusion enables those put under strict liability by their act or omission to assist the promotion of the law. Kartar Singh v State of Punjab, 1994 (3) SCC 569: The element of mens rea must be read into a statutory penal provision unless a statute either expressly or by necessary implication rules it out. R v. Prince, L.R. 2 C.C.R. 154 (1875): Henry Prince was accused of abducting a 14-year-old girl, Annie Phillips, having believed her to be 18 years old. Such an act was at that time in violation of Article 55. Prince argued that he had made a reasonable mistake in regards to Phillips' age. Despite his excuse for the crime, he was ultimately convicted. It was held that the mens rea necessary for criminal liability should be required for the elements central to the wrongfulness of the act, and that strict liability should apply to the other elements of the statute. Sherras v. De Rutzen, (I.Q.B. 918): It has been laid down that mens rea is an essential ingredient in every offence ex­cept in three cases: (1) Cases not criminal in any real sense but which in the public interests are prohibited under a penalty; (2) public nuisances; and (3) cases criminal in form but which are really only a summary mode of enforcing a civil right.